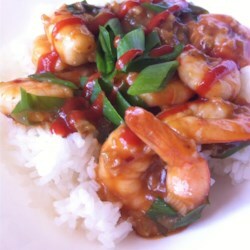 Used 2#s of raw shrimp, tripled the sauce and added just a little more red pepper flakes as we like things SPICY. There wasn't any left, even my 4 year old cleaned his plate! Goes perfect with either steamed or fried rice. Thanks for a super easy, way yummy recipe!